If you frequent my blog or my twitter account you know I LOVE POWER and Counter! I am often asked how I work the blocks associated within the schemes. I set up my drills up in a way that I think is efficient and maximizes my players’ reps. I work our down blocks and double teams as separate drills. I have written some about my general blocking progression (that can be applied for down blocks) here and here. What I am about to share is how I work all of the other necessary blocks on Power and Counter in an efficient way. First I teach the kids the name of the drill so we can move faster (speaking the same language). I call this “backside pulls”. They know which line to get into. We always start off setting up for Power Right. All Centers are in one line. All Guards are lined up at LG. 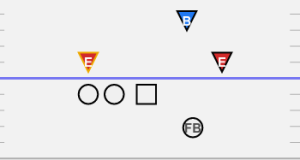 All Tackles are lined up at LT. All FBs are aligned to the right. 2 players hold bags as DEs. 1 player holds a bag as a LB. Keep your lines of kids to rotate at least 5 yards deep so the kids getting the reps have room to pull. The blocker takes the bag and becomes the defender. The defender jogs around and joins the line for their position. The other Center(s) catch the snap from the Center getting the rep. The FBs practice their kick out. The LG skip pulls. The Center works back. The LT Works the hinge on the DE. I let the backside DE play games, sometimes slanting across the face, sometimes changing it up. This lets them get a variety of looks. Now the LG is kicking out the DE. The Fb is pulling to wrap up to LB. The Center and LT’s job stay the same. 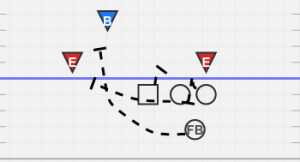 Now that we have blocked both plays to the right, we turn around to switch our lines and now we block to the left. The FBs kick out the DE. 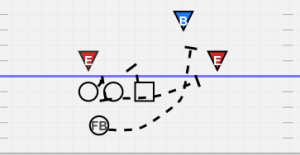 The RG skip pulls to LB. The RT will step to B gap and hinge. The center will snap and block back. Again we just bump the FB over to transition quickly and we are set up for Counter left. 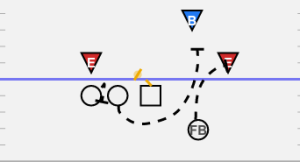 The RG pulls and kicks out the DE. The FB pulls and wraps up to LB. The Center and RT’s continue to rep the same skills. When I first teach this drill I go much slower, and I take more time. 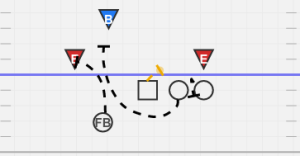 In Spring Ball i will spend probably 5 minutes on each play because they are still learning so much (so 20 total for the circuit). By the time we hit the season it is roughly 2-3 minutes a play before we switch to the next one. As your players improve you can begin to work more advance skills in. You can have your bag holding DEs squeeze and wrong arm to get your kick out man practice at “Logging” and get your 2nd puller (wrapper) practice at seeing the log, bouncing around the log, and finding color. The biggest changes in football are not RPOs they are what we are doing now and in the future to ensure player safety. Brain health is no joke and the way society is moving progressive measures to keep players from full contact is reality. Here in California a rule is about to pass where we can’t wear helmets all Summer, not even for 7on7 because they do not want the risk of players making contact. What I love about this drill is that we can get great work from it, improve our skills, AND avoid beating each other up. We always do these drills with the defenders holding bags/shields. We do these drills the same whether we are in full pads or no pads. We are a smashmouth team every Friday night, but Monday-Thursday we are not risking injury and slamming into one another. A lot of this comes from our culture as football coaches (and former football players) that drills have to be about “toughness and violence” but they DON’T! Drills are about making your players better at what they need to do for you to win games. They can’t win games when they are sitting out for a month on the sideline. 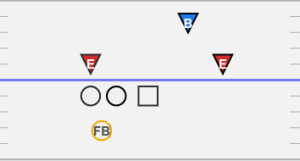 This entry was posted in CoachBDud Material, Offense, Offensive Line, Run Game. Bookmark the permalink.